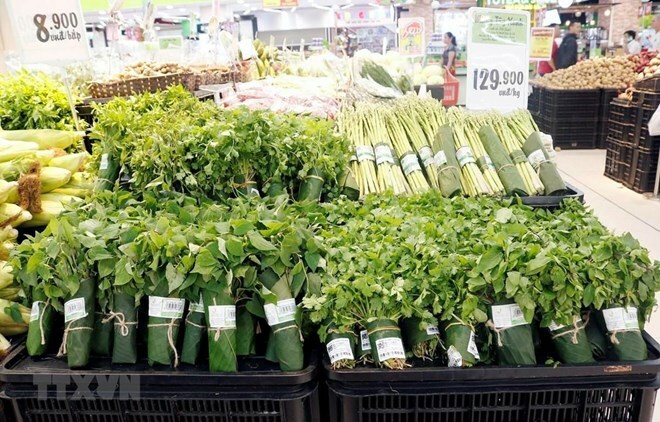 Hanoi (VNA) – Prime Minister Nguyen Xuan Phuc has praised several supermarkets for using natural alternatives in wrapping goods, saying it contributes to raising public awareness of protecting the environment for the community’s benefits. Co.op Mart Vietnam, Big C Da Nang and Big C Hanoi have used banana leaves to wrap foods in an effort to slash plastic waste. In his letter sent to these supermarkets on April 4, PM Phuc called on the business community, supermarkets, restaurants and hotels to join in efforts in reducing plastic bags and waste. He suggested the Ministry of Natural Resources and Environment, the Ministry of Industry and Trade, the Ministry of Science and Technology, the Ministry of Information and Communications, relevant branches and local authorities encourage the use of environmentally-friendly goods while cutting the production of plastic bags. Vietnam is one of Asia’s five worst polluters of ocean plastic waste, according to international organisations. With 13 million tonnes of waste released to the ocean every year, the country ranks 17th in the world for ocean plastic waste pollution. Although there are no official statistics on the amount and varieties of plastic in the Vietnamese sea and islands, plastic waste is easy to see in Vietnamese waters, with the country’s 112 estuaries the main gateways of plastic to the ocean. Numbers from Vietnam’s Association of Plastics illustrate the scale of the problem. In 1990, each Vietnamese consumed 3.8kg of plastics per year, but 25 years later, the figure hit 41kg. As many as 1,000 plastic bags are used each minute but only 27 percent of them are treated and recycled.